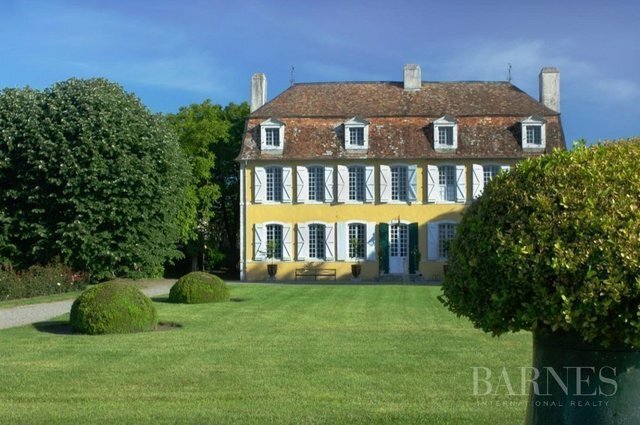 Authentic 18 th century manor house of approximately 550 m² of living space and having preserved all the original features. This house consists of 2 kitchens, 2 living rooms, dining room, 2 bathrooms, 3 shower rooms and 8 bedrooms. Terracotta tiles, parquet floors, fireplaces, stuccos, doors, everything is here to please 18 century enthusiasts. Outbuildings and orangery of 260 m², cellar 50 m² and a lovely garden of 9000m² with a swimming pool. Views of the Pyrenees and shops 5 minutes drive. Situated near a salmon fishing river and the historical town of Navarrenx, it is possible to drive to the Basque coast in 55 minutes.